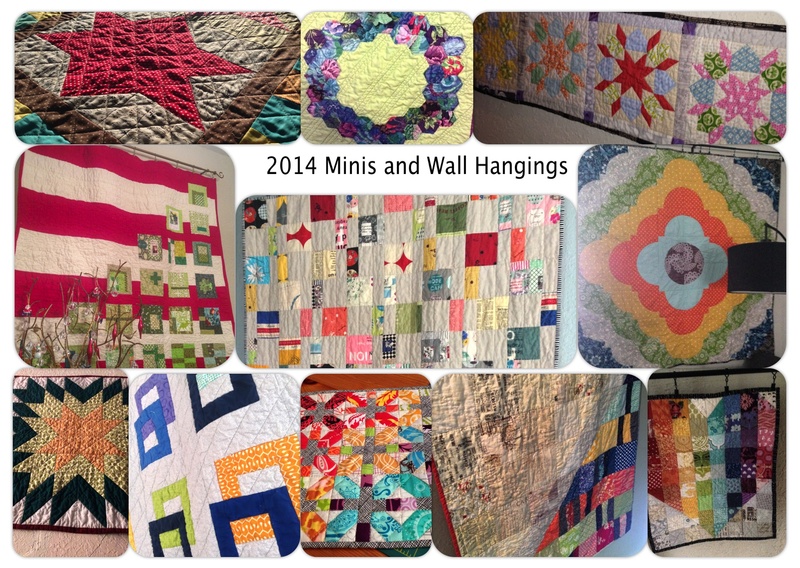 Here are some picture collages of quilting projects. Woot. Happy New Year! 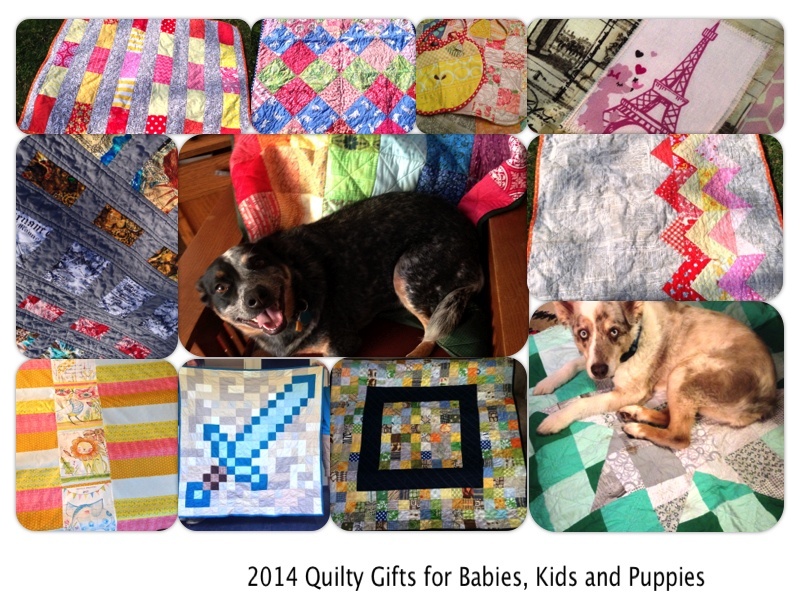 This was definitely the year of baby quilts… quilts for charity, quilts for wee minecraft lovers, quilts for puppies. I love baby quilts, small, manageable, can get an idea out of my head without a giant commitment. 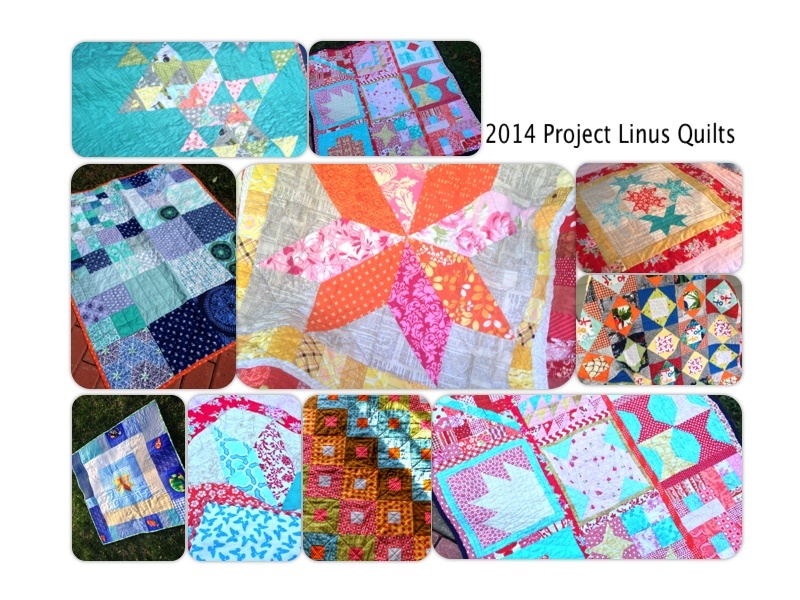 I fell one quilt short of my Project Linus goal – but I am very happy with the 11 quilts that hopefully served some kids and families well. And I brought some joy to my friends with some pretty sweet quilty baby, toddler, and kid gifts. The pouches and bags are really where I learned the most this year. Zippers and paper patterns and boxed corners. Some pouches were so bad, I pretended they never existed (and aren’t pictured), but by the end of the year I made some stuff I am very proud of. 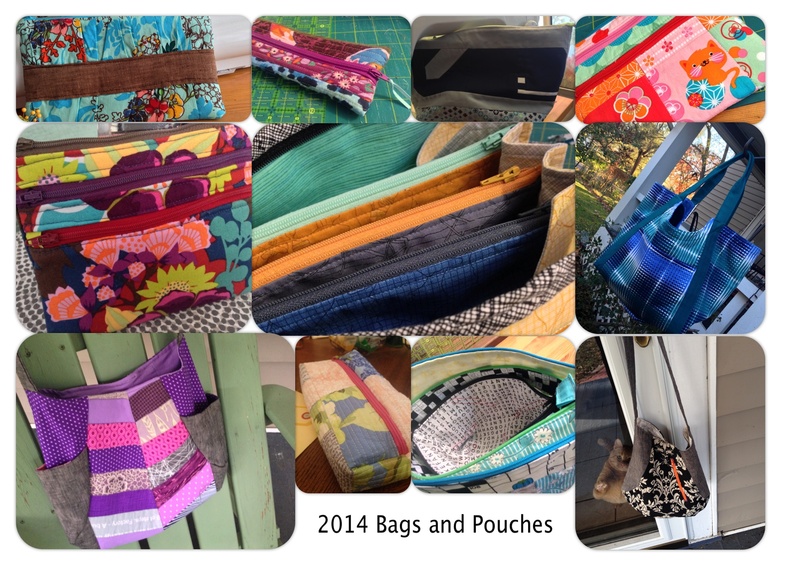 That 241 tote in the lower right is the crowning glory – finished just a couple days ago. Oh! All the wall hangings. For living room, dining room, kitchen, bedroom and hall. Almost all walls in my house have some sort of soft covering. So there’s that. 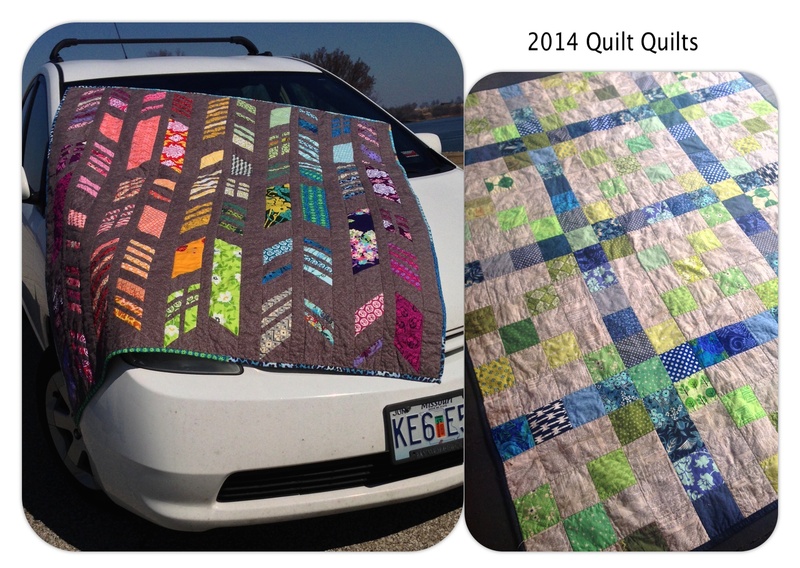 Yes, a quilter who only finished two quilts in a year. The Feathers Quilt is by far the best thing I have ever made. It was a lot of work, but totally, totally worth it. I think I may need to make some more quilts with dark backgrounds based on the success of this quilt. And then there is my enlarged irish chain quilt. Well, it’s done. That can be said for it. Last year I was so jealous of all the bloggers who had all those awesome end-of year montages. And now I do! And I can’t wait to get started on 2015 quilting. Lots more bigger, time-consuming projects – mostly quilt quilts. And maybe some baby quilts to sell. And I probably need to get serious about some scrap busting. I can’t wait. A final note on the year. I included pictures of nearly all of my completed projects here. But one little guy didn’t get recorded here or anywhere in the blog. 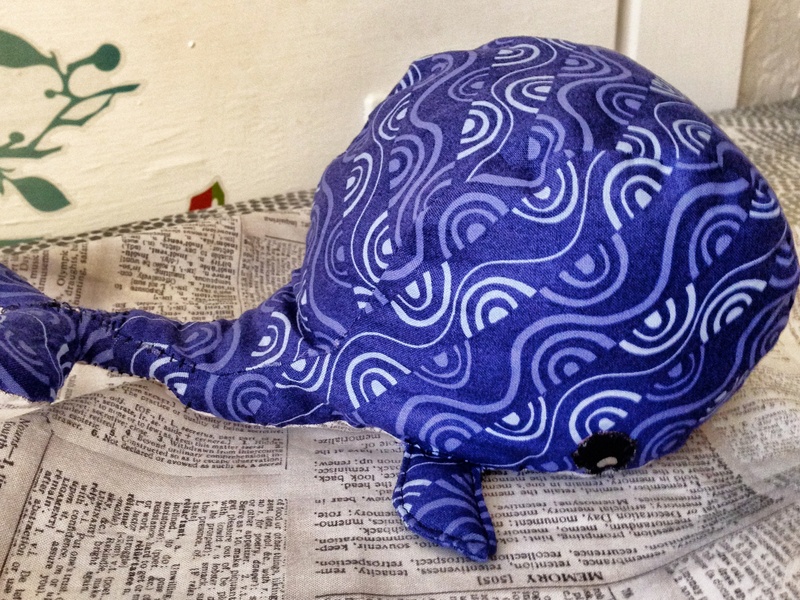 I made a little whale for my niece for her birthday in April. A true Fail Whale. And a metaphor for 2014 – time-consuming, wonky, and ridiculously adorable.